Hooray !!! I found an aappam recipe that does not require coconut in any form. 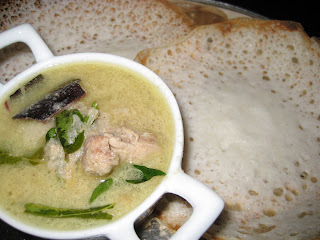 If you are looking for a working combination of aappam and stew, then look no further, for you are in the right place. If you are looking for an authentic Keralan recipe, then this is not it. I’ve been looking around for a non-coconut recipe and finally spotted it here. It is a down to earth no-nonsense food blog and is to-the-point. There is an elaborate catalogue of South Indian veggie recipes. I am raring to try the snack recipes. The stew is derived from 3 different recipes. The basic is from Mandhu Jaffery's Flavour's Of India. The second source of inspiration is from this lovely blog. Finally the idea to pressure cook the stew is from here. 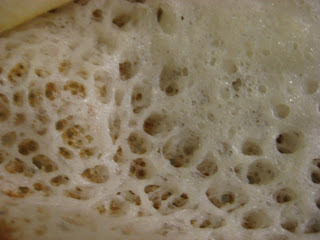 Oh yes, the original recipe for aappam had coconut, but I cut it off and it still tasted great. Wash and soak the rice, lentils and fenugreek seeds for at least 8 hours. Grind them to smooth batter. It takes quite a while even in the grinder. Add salt to the batter and ferment it overnight. If living in cold countries shove the batter container in an oven and turn on the light. Or better still sit the container in the boiler room overnight (this never fails, if you have the boiler on for a reasonable period of time in the night). When it’s cooking time, add the cooking soda to the batter and thin it with water or coconut milk to a consistency that is between double and single cream. The batter should flow freely. Take a big ladle of the batter and pour it on the aappam chatti (wok) and rotate it to spread the batter in the wok. You will end up with thin batter on the sides and the rest settling in the middle. Cover it with a lid and cook until done. If you don't own an aappam chatti, you can use small size frying pan (which is what I did before I owned an aappam chatti). The resultant aappam was light with the crispy sides and fluffy centre – in one word perfect. Small onions or shallots - 4 finely sliced. Heat oil in a pan and add in the whole spices. Saute for a few seconds and then add the onions, ginger and chillies and fry till the onions are transparent. Add the flour and saute for a minute. To this add the chicken and potatoes and give it a stir. Season with salt and then add the coconut paste, poppy-fennel powder and some water (if your stew is very thick). Close the cooker and pressure cook to 2 whistles. When the steam is settled, open the cooker and adjust the water level (if too thin boil off the excess liquid in a high flame, if too thick dilute it with some water). Heat a small pan and add some oil. When the oil is hot add the sliced shallots and fry it until golden. To this add the curry leaves. Pour the onion-curry leaves seasoning into the stew and remove from fire. Finally add the lemon juice and mix well. The troops loved it. To be honest, I was surprised by the wonderful flavour of the stew. This is one lipsmaking recipe and will find a place of pride in my everyday menu. I tried chicken stew this week and came out very delicious. That ws very simple and fast to cook.